The No. 6 ranked Clarkston Angoras opened the night at Hallford Stadium with a 6-1 win over neighborhood soccer rivals Stone Mountain Pirates in the beginning of a Clarkston sweep. 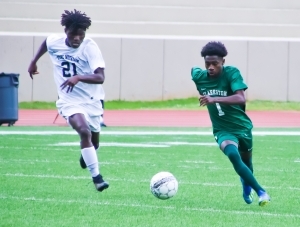 The non-region matchup between the DeKalb rivals opened with the Angoras (12-2-1) scoring in less than two minutes as Emmanuel Ngoy put the ball into the right corner of the net for a 1-0 Clarkston lead with 38:15 remaining in the first half. 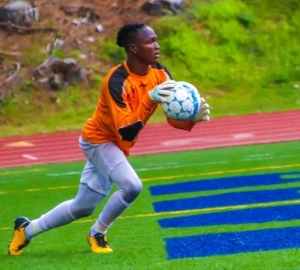 Stone Mountain goalie Byona Byaruhanga made five big saves in the first half to keep the Pirates (6-6-1) within one score of tying the game. Clarkston broke through again with just 5:40 to play in the half as Niyokwizera Elvis found the right corner open to make it a 2-0 Clarkston lead. Stone Mountain had an opportunity to pull within 2-1 with just a minute to play in the first half, but a goal was disallowed by an offsides call and Clarkston would hold the 2-0 advantage at the half. The two teams and fans were sent scrambling at the half as lightning caused over an hour delay before the second half could get underway. Clarkston captain Elie Tshiamala extended the lead to 3-0 at the 32:03 mark of the second half with a blast from about 25 yards out. Abdul Toule’s shot on goal with 17:59 to play was tipped by a defender and past the goalie to make it 4-0 in favor of the Angoras. Just over two minutes later Alex Kalombe got the Pirates on the board by beating a defender one-on-one and firing a shot off the goalie’s hands and into the net to cut the lead to 4-1 with 15:22 to play. Clarkston scored two more goals in the final four minutes to close out the 6-1 win. The goal at the 3:57 mark came off the foot of Achier Soumaine with an assist by Haftom Sahlu to make it 5-1. Gezia Eta got loose down the middle of the Stone Mountain defense for his goal to close out the 6-1 match. The Angoras will celebrate senior night on Thursday as they host the Class 6A No. 7 ranked Cambridge at Hallford Stadium. 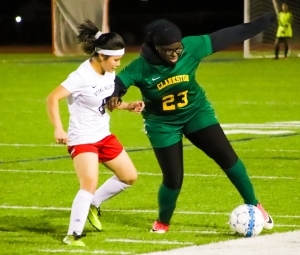 Bu Meh put together a nice hat trick in the first half as the Clarkston Lady Angoras (10-4-1) cruised to a 7-0 win over Stone Mountain (3-9) in a time shortened girls’ game as the nightcap. Just over a minute later Bu Meh would score the first of her three goals in the game by beating the defense for a point-blank range shot to push the lead out to 2-0 with 29:12 to play. Six minutes later it was Meh again, this time on a pass from teammate Milan Collette as the lead grew to 3-0. Collette got her own goal with a nice shot from in front of the goal on a break-away to extend the lead to 4-0. Meh completed her hat trick in the first half scoring her third goal with 14:23 to play in the half for a 5-0 Clarkston advantage. Lai La scored before half to put Clarkston up 6-0 at the break. Esther Mbilizi scored the final goal of the game slipping past the defense for a point-blank shot for the final score of 7-0 less than five minutes into the second half.